Exhibitions come in all shapes and sizes and you’ll have to decide which suit you best – the temptation can be to want to head only for shows with a huge visitor turnout. However, don’t rule the small shows out! Exhibiting at smaller shows can offer some really valuable and focused visitors, but they can be very different to the bigger shows so we have come up with a few tips for you. Usually what comes with a smaller exhibition is less space for your stand and a smaller distance between you and other stands. This is not always a bad thing, you just need to know how to get the most out of your space. Modular stands are great for this because you can adjust it completely to fit the space that you are in. Remember that also if you lack floorspace you don’t lack airspace, so you can build your stand upwards! Many modular stands include columns that can be build up to hold large graphics, and in a small show this will really catch the eye. Focus more on the branding of your stand rather than the size, make sure everything is presentable and very focused towards grabbing people’s attention and getting them to engage in some way. Having a cohesive stand can really make a difference especially when that is what will attract someone over to you. Use a table to go out as far as you can, this way you are more within the crowd and can seem easier to approach and talk to – don’t overstep your boundary however. Let people know that you will be at this exhibition, give them the details they need and help raise awareness of this exhibition. People can’t come along if they don’t know about it, give the organisers a helping hand and let your social audience know about this show, you could even send out a email to your contacts. If you are running a competition or offer at this show then let your audience know about it because people who have been undecided may just come for your competition or offer. Your team is so important at exhibitions, you need to take the right people with you to produce energy on your stand. It’s best not to take a lot of team members with you, especially to a smaller show – this can intimidate people much more than one or two people will. 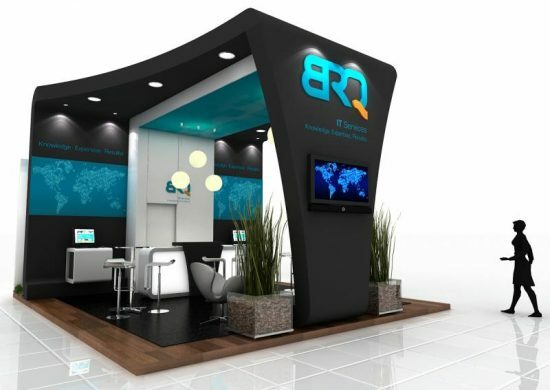 The people who are manning your stand are representing your business and need to present the best image that they can. Ensure also that team members area ready to make eye-contact and connect with visitors, which can work especially well at a small show. Starting a conversation with someone is the best way to get them to engage with you, don’t tell them about you and your business the whole time, find out about them and what they do. Once you know a bit more about them you can work out how you could possibly help them and how your business could benefit them. On the other hand, it is just a great way to network with people and build connections. Engaging with people is especially important at smaller shows because you are likely to get a smaller footfall at the show and to your stand so engage with the people you do meet and get them talking. Other people like to see a stand that’s busy or at least engaging with people. Having a smaller audience is the perfect chance to ensure you really target your stand marketing – take the opportunity to research the kind of visitors that will be attending. This might involve researching the business sector the show is catered for, or the local region it covers.